At the end of the year Keystone Mascots' Training Camp alumnus (we'll call him) Mike contacted us about his desire to create a mascot team for Camp Curtin Academy in Harrisburg, Pa. Harrisburg is a local city that is dear to Keystone Mascots' staff hearts, and Mike's idea of having a mascot team for this Kindergarten to 6th grade school was a creative concept that we wanted to invest in. Enter the Leopard.... Levi Leopard. Levi is a fun character that the students are developing for rallies and extracurricular events support. We can't wait to see what Levi is going to accomplish in the hands of Mike and his kids! Click here to see Levi's "Tribute to Michael Jackson" skit. 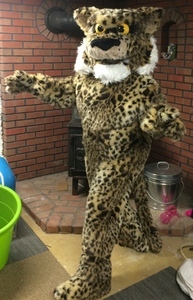 Click here to see Levi's "Do the Twist" skit, and let the mascot team know they're starting off on the right spot! © 2019 Keystone Mascots. All rights reserved.